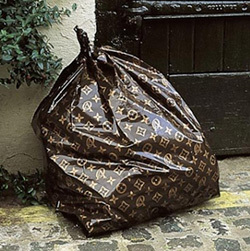 Louis Vuitton Trash Bags | OhGizmo! Just because you’re doing something as unglamorous as taking out the trash doesn’t mean you can’t do it with a little style. While Hefty has long since taken the safe approach when it comes to fashion with their all-black garbage bags, it seems there’s now a more daring option with these Louis Vuitton pattern bags. Perfect for the homeowner who thinks their trash is just a bit better than everyone else’s. Unfortunately, since the pattern seems to be lacking the ‘LV’ initials, it’s pretty clear this bag didn’t come from Louis Vuitton. But if anyone knows where it did come from or where they can be bought, I’m sure our readers would love to know. It appears to be an over-sized shopping bag. However, logic dictates that it is a garbage bag, even if the trash was purchased at a retail outlet and taken home. Home Automation Surrey provides added comfort, convenience, enhances your security and produces enviromental savings in all your home systems which you automate. Home automation surrey can control all aspects of your life but with you in total control of how much. It looks like a Jacket Bag from the store.